“I thought it was the most beautiful, wonderful sound I had ever heard in my life,” recalls the UNCG senior. Ortiz had grown up listening to mariachi music and Mexican artists. Classical music was a new discovery for the young girl. That was 11 years ago. She’s now on track to earn a music education degree this spring. Ortiz chose UNCG, she says, because of Associate Professor of Music Education Rebecca MacLeod and her work on the Lillian Rauch Beginning Strings Program. The ambitious project has provided free music instruction to hundreds of local children over the years, many from groups underrepresented in string education. The program, which involves a partnership between UNCG, the Greensboro Symphony, and two Guilford County schools, also allows music education majors the opportunity to develop as teachers in a diverse setting. Ortiz, whose family couldn’t afford music lessons, turned to YouTube videos for further instruction. Understanding how hard it is for some students to access music education has fueled her desire to teach music in underserved public schools. “I knew that I wanted to come here and make a difference,” she says. She’s made a difference at Guilford County’s Peck Elementary, through teaching but also through scholarship. As a freshman, Ortiz examined how families from diverse backgrounds prefer to communicate with teachers. The study, funded by a UNCG Undergraduate Research, Scholarship, and Creativity Office grant, aimed to increase parental involvement in school-related activities. She found that preferred forms of communication – from text messages to calls to email – varied by cultural group. She also learned it was easier to connect with parents during the day, because many worked at night. Ortiz’s latest research project looks at peer mentorship as a model for private music instruction. In near-peer mentoring, an older student mentors a younger student. At Peck, middle and high school students who graduated from the elementary school’s violin program return to help mentor and teach. She found that near-peer mentorship benefits both mentees and mentors. Younger students experienced greater success with their instruments. Mentors reported improved communication and leadership skills and increased interest in playing and in collaborating with others. They found that teaching helped them better relate to their own teachers. The experience also made mentors more attentive to their own performance, raising their own skills. 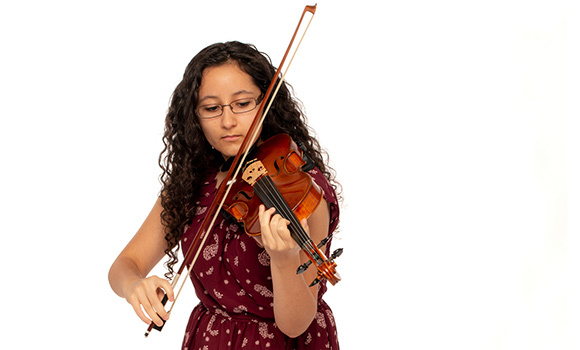 The research, which she plans to present this spring at the annual American String Teachers Association Conference, won third place in the arts and humanities category of UNCG’s undergraduate research expo last year. She also presented it at the SoCon Undergraduate Research Forum. Ortiz hopes her findings will lead to more funding for programs in socioeconomically disadvantaged schools like Peck, so students from any background can get instruction previously only available to people with means.